Miss Talla Dega is a high energy yellow lab I purchased for hunting and companionship. Dock diving is a great bonus in her purpose. 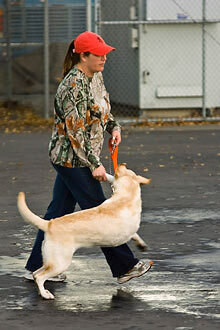 In June 2008 after a normal sunny day playing at the water park, Dega began limping — favoring her right front leg. My immediate thought was that she must have hit the water too hard. I decided I would give her a three-week rest break. When we went back to the water her limp returned after only a half hour of play. Still thinking it was something simple that just needed rest; I gave her another three-week break. Upon our second return to the water her limp returned after her first retrieve. That is when I knew I had to get her in for an x-ray appointment. I was truly blind sided by the results. I thought she might, at worst, have a fracture, pulled ligament, or muscle. I was in complete shock to receive a referral to an Oncologist and the possibility my three and a half year old Dega could die shortly. It is with that our journey to becoming a cancer survivor began. I feel as if the beginning of it all would be the most important thing to tell people. Dega is a purebred yellow lab; one of the sixth generation of a Labrador bloodline associated with our family. When history says the line is healthy and strong it can create a false sense of security. I felt guilty and ignorant for not knowing that my dog had any potential for cancer. Cancer literature states that an estimated one in three dogs will get cancer. Something in all my years of owning dogs that I would not have imagined. I have learned that cancer in dogs is an overwhelmingly common occurrence. 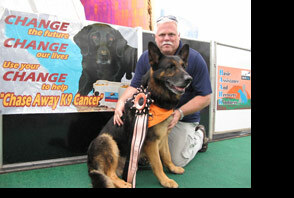 I hope Dega’s story will inspire people to support the cause to research and help find a cure for canine cancer. After the multiple visits to the veterinarians, discussions with specialists and personal research, I was faced with three options. 1. Remove her right front leg, shoulder, and shoulder blade entirely. Dega would have a normal life expectancy and still be able to enjoy hunting and dock diving with therapy and training. 2. Remove the bone itself. However, more often than not, with just the bone removed, Dega could be permanently lame, retired, and/or with a broken wrist. She would also likely have a long road of chronic pain and difficulty and forced very restricted activity! Dega’s spirit did not match options 1 or 2. The third option of letting her be go happy and whole began to cross my mind. After a roller coaster of emotions, I ultimately decided based on facts, and the hope that I was doing the right thing. It took time for the Oncologists to convince me that Dega truly would be able to do everything with three legs. I went for second and third opinions and received the same limited options. 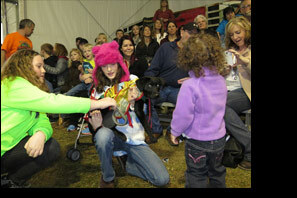 I digested a lot of information on line at Chase Away K9 Cancer and the ACVIM foundations sites. If you are ever faced with this remember to bring a friend or family member with you to all doctor appointments. The emotional roller coaster ride can cloud the facts and distort your decisions. I was encouraged to keep my head up throughout our journey. A person who is my best hunting buddy reminded me that our pets rarely out live us. My heart told me Dega was a great candidate for Miracle dog. Dega’s actions during this process tugged at my heart and I was beginning to see a blessing in disguise. I decided, finally, to remove Dega’s right front leg. The day of surgery was most frightening, but surgery was successful. Dega was up and walking six hours after surgery and on her first attempt. The hospital kept her for 32 hours before we could pick her up. As we prepared to lift her into the truck, she moved to jump onto the tailgate!! Leg removal, twenty stitches, and a night of morphine, had not changed this marvelous dog’s will and spirit. Dega’s recovery took two weeks and made me a 24-hour a day nurse. She was free to kennel up in the truck on day 15. The doctors released her to swim in the third week. She proved that swimming was an easy task for her too. At three and a half months after surgery, Dega is enjoying a normal life with dock diving. She is jumping off the dock at 15 feet. She has been quail hunting, and had a blast flushing and retrieving in rough terrain. She can catch a Frisbee like any other dog and she still swims like a fish. Our goal is to give Dega a year recovery. We expect greater improvement in activities throughout 2009. Cancer does not have to be the end of your dog’s active life. Miss Talla Dega is just one of many canine cancer survivors continuing to bring joy to us. 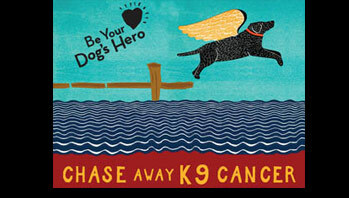 Remember continued support and donations canine cancer foundations will make the difference for many dogs with cancer.